This website and its contents are intended for your personal use. Unless otherwise noted, all content on this site, including text, graphics, logos, button icons, images, audio clips, and software, is the property of amerisleep.com and protected by United States and international copyright laws. All software used on this site is the property of amerisleep.com and protected by United States and international copyright laws. Third Party content providers also own copyrights in the content original to it. You may not modify, publish, adapt, transmit, participate in the transfer or sale, exhibit, distribute, display, reverse engineer, decompile, dissemble, perform, reproduce, create derivative works from, or in any way exploit any of the site content, on this site, in whole or in part. You may download or copy one copy of the site content for personal, noncommercial use only, provided that no changes in or deletion of author attribution, trademark, legend, copyright notice, or other proprietary notices shall be made. Downloading or copying site content for other than personal, noncommercial use is expressly prohibited without the prior written permission of us or any other copyright owner. You acknowledge that you do not acquire any ownership rights by downloading or copying any of the product listings, descriptions, or prices, nor may you frame or utilize framing techniques to enclose any trademark, logo, or copyrighted material from the site or use any meta tags or any other hidden text utilizing our names or trademarks, without our express written consent. You shall be solely responsible and liable for any and all damages resulting from any infringement of copyrights, proprietary rights, or any other harm resulting from any uploading, posting or submission of your content on the Site. The Amerisleep Web site and logo are service marks of AmeriSleep. All other trademarks, product names and company names or logos cited herein are the property of their respective owners. The receipt of an order number or an email order confirmation does not constitute the acceptance of an order or a confirmation of an offer to sell. Amerisleep reserves the right, without prior notification, to limit the order quantity on any item and/or to refuse service to any customer. Verification of information may be required prior to the acceptance of any order. Prices and availability of products on the Site are subject to change without notice. amerisleep.com and its affiliates attempt to be as accurate as possible. However, we do not warrant that product descriptions or other content of this site is accurate, complete, reliable, current, or error-free. Errors will be corrected when discovered, and Amerisleep reserves the right to revoke any stated offer and to correct any errors, inaccuracies, or omissions (including after an order has been submitted). In the event a product is listed at an incorrect price or with incorrect information due to typographical error or error in pricing or product information received from our suppliers, we shall have the right to refuse or cancel any orders placed for products listed at the incorrect price. We shall have the right to refuse or cancel any such orders whether or not the order has been confirmed and your credit card charged. If your credit card has already been charged for the purchase and your order is canceled, we shall immediately issue a credit to your credit card account in the amount of the charge. We apologize for any inconvenience this may cause you. From time to time there may be information on our Web Site or in our catalog that contains typographical errors, inaccuracies, or omissions that may relate to product descriptions, pricing, and availability. Amerisleep.com reserves the right to correct any errors, inaccuracies or omissions and to change or update information at any time without prior notice (including after you have submitted your order). Reduced prices and/or discounts cannot be applied retroactively to purchases made prior to the start of a weekly sale or daily deal, or to purchases made after the end of a weekly sale or daily deal. The featured offers, prices, and/or discounts only apply to items available for sale on the website and cannot be combined with any other offer. Our web sites are general audience sites. Children under the age of 13 should always ask their parents or guardians for permission before providing any personal information to anyone online. We urge parents and guardians to participate in their children's online activities and use parental control or other web filtering technology to supervise children's access to the web. By making a purchase, you are agreeing that you are at least 18 years of age (or supervised by a legal guardian) and legally bound to these terms and conditions. Harassment in any manner or form on the site, including via e-mail, chat, or by use of obscene or abusive language, is strictly forbidden. Impersonation of others, including an amerisleep.com or other licensed employee, host, or representative, as well as other members or visitors on the site is prohibited. You may not upload to, distribute, or otherwise publish through the site any content which is libelous, defamatory, obscene, threatening, invasive of privacy or publicity rights, abusive, illegal, or otherwise objectionable which may constitute or encourage a criminal offense, violate the rights of any party or which may otherwise give rise to liability or violate any law. You may not upload commercial content on the site or use the site to solicit others to join or become members of any other commercial online service or other organization. Amerisleep makes no claim or representation, and accepts no responsibility, regarding the quality, nature, or reliability of the sites accessible by hyperlinks from this Site, or Web sites linking to this Site. No fees will apply for orders canceled for products that have not shipped. If you require the cancellation of an order after it has been shipped (but before it has been delivered), please give us a call or send us an email so that we can stop the shipment. The order will be returned to our shipping facility, at which point a refund can be processed. If the order has been delivered, it must be left in its original packaging. Please call our customer service line at 800-500-4233 or email [email protected] so that we can have the order picked up. Once it has returned to our shipping facility, we will complete your refund. 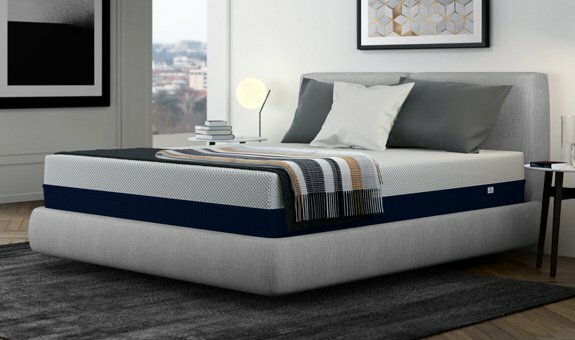 If you require the cancellation of an adjustable bed after it has been shipped (but before it has been delivered), you will be responsible for a 25% restocking fee and for shipping fees incurred to and from our our warehouse (up to an additional $450). Only mattresses in new condition within the 100-night trial period are eligible for return. No unauthorized returns will be accepted. Authorization to return must be obtained from amerisleep.com via e-mail. All returns are subject to approval. Please open and carefully inspect your package upon receipt. You must notify us within 5 business days if you received a damaged or defective product. It will be repaired or replaced at no charge to you. For Oversized Delivery Items, damage must be documented on delivery paperwork. Please refer to the "Oversized Delivery" section. Oversized items, like Adjustable Beds, are delivered via freight carrier directly to your address. This process usually takes 1-6 weeks. Please allow an additional week for more rural areas. The freight carrier will contact you with the telephone number(s) you provided us at checkout. Please make sure these are accurate. The freight carrier will contact you 24-48 hours in advance to schedule delivery. Available delivery times will vary depending upon the freight company's schedule. Most items will be delivered to only the nearest ground level entrance of your home/business. Exceptions include apartments and unusual driveways. Many freight carriers will provide stair service or bring the item(s) to a specific room for an additional fee. Please see the fee schedule below. Before signing the delivery receipt, inspect the carton(s) for damage (including dents, crushing, creasing, tears, etc) and note this on the receipt. The driver is not required to wait for you to unpack the item unless visible damage is seen. It during delivery, it is obvious the item(s) are damaged, you may ask the driver to unpack and inspect the contents with you. If damage is found, clearly note it on the delivery receipt and write "Refused due to damage". Be sure to keep your copy and Contact Us immediately. After you accept delivery, it is a wise idea to keep all packing slips for at least 30 days. Redelivery: If you miss your delivery appointment, the freight carrier may charge you a fee ranging from $199-$399. The decision to redeliver is solely that of the freight carrier. Your item(s) may be redelivered to Amerisleep if you miss you appointment or if the freight company is unable to contact you. In the event this occurs, the cost of return shipping will be deducted from your refund. Please see the Refused Delivery section. Refusal of Delivery: If delivery is refused, please call our customer service line at 800-500-4233 or email [email protected] to inform us that the delivery was refused so that we can issue a refund. By purchasing an oversized item, you authorize Amerisleep and/or the freight carrier to assess any additional fees as necessary to the credit card according to the fee schedule that is above. Amerisleep intends for the information and data contained in the Site to be accurate and reliable, however, since the information and data have been compiled from a variety of sources, it is provided "AS IS." You expressly agree that your use of this site is at your sole risk. ASTRABEDS, LLC EXPRESSLY DISCLAIMS all warranties and/or conditions, express or implied, as to any matter whatsoever relating to or referenced by this site, including, but not limited to, the implied warranties and/or conditions of merchantability or satisfactory quality and fitness for a particular purpose and non-infringement. IN NO EVENT SHALL Amerisleep OR ITS OFFICERS, DIRECTORS, EMPLOYEES, AGENTS, SUCCESSORS, SUBSIDIARIES, DISTRIBUTORS, AFFILIATES OR THIRD PARTIES PROVIDING INFORMATION ON THIS SITE BE LIABLE TO ANY USER OF THE SITE OR ANY OTHER PERSON OR ENTITY FOR ANY DIRECT, INDIRECT, SPECIAL, INCIDENTAL, PUNITIVE, CONSEQUENTIAL OR EXEMPLARY DAMAGES (INCLUDING, BUT NOT LIMITED TO, DAMAGES FOR LOSS OF PROFITS, LOSS OF DATA OR LOSS OF USE) ARISING OUT OF THE USE OR INABILITY TO USE THE SITE OR ANY INFORMATION CONTAINED THEREON, WHETHER BASED UPON WARRANTY, CONTRACT, TORT, OR OTHERWISE, EVEN IF Amerisleep HAS BEEN ADVISED OF OR SHOULD HAVE KNOWN OF THE POSSIBILITY OF SUCH DAMAGES OR LOSSES. This Web site is operated by Astrabeds, LLC from its offices in Tempe, Arizona, USA. The law of the State of Arizona shall govern these terms and conditions, without reference to its choice of law rules. Astrabeds, LLC makes no representation that the information in the Site is appropriate or available for use in other locations, and access to the Site from territories where the content of the Site may be illegal is prohibited. Those who choose to access the Site from other locations do so on their own initiative and are responsible for compliance with applicable local laws.